Welcome to Buy and Hedge - the smarter evolution of buy and hold investing. It's smarter because it limits your downside risk and uses low-cost techniques. What are the results of smarter investing? You will enhance your risk-adjusted returns. Jay discusses the impact of the presidential polls on the stock market. Wayne discusses the 3 E's: Earnings, Economic Indicators, Europe on Fox Business. 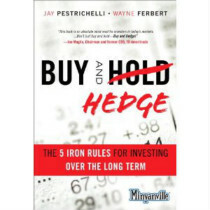 Our book, Buy and Hedge: The Five Iron Rules for Investing Over the Long Term, was officially published on October 6th! Click here to order the book on Amazon.com!! Click Cover to buy the book!